Did you know that pumpkin seeds (and to some extent, the flesh) have anti parasitic properties in ruminants? Our sheep always come running when they see the tasty round orbs in my hands as I approach their fields. I admit, it’s super satisfying to watch them explode across the ground as I toss them into the field, too! 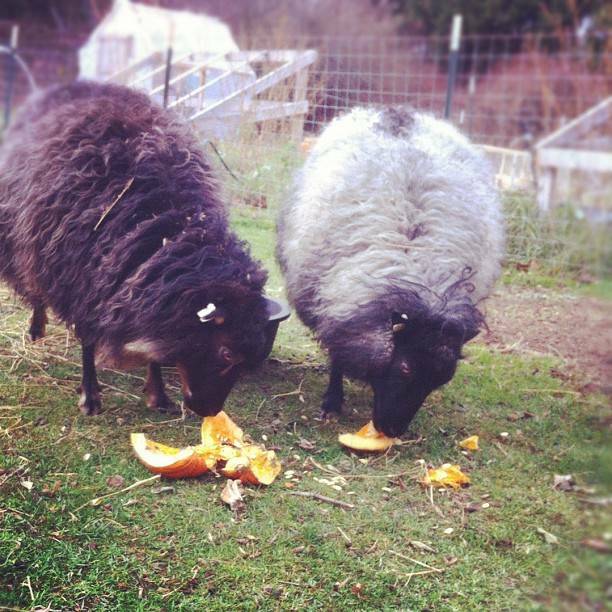 Our sheep aren’t the only ones who enjoy the pumpkins, though. Our chickens and ducks do too, and I’ve broken up more than one squabble as the hens have fought over the perfect pumpkin seed or strand of pumpkin guts. Our turkey, however, cannot be bothered by treat-like morsels this morning. He is too busy professing his love to one of the Cochin hens, strutting about and poofing up like a love-struck teenager. Poor chap, I’m not sure if it’s more sad that he’s crossed in love, or that his days are numbered in general. One other form of natural parasite control that we use is pine needles, and the sheep get branches from our windbreak weekly throughout the winter. For now, though, I find myself begging and bartering for leftover pumpkins and squash into the depths of the fall season. 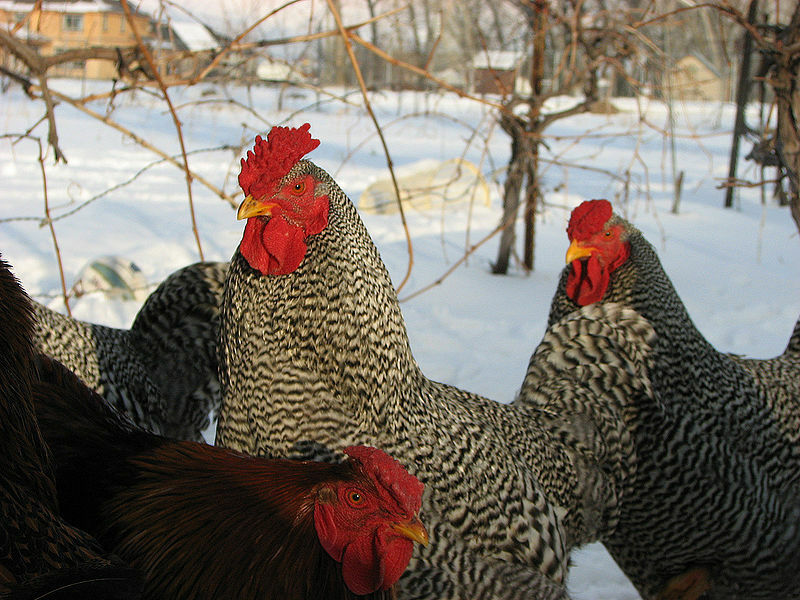 Have you ever used a natural form of parasite control for your livestock or pets? Not Dabbling has been on my daily browsing list for quite some time now. I will admit that I am a lurker. Always reading – Never posting. I grew up in rural Tennessee on a 150 acre farm. In the late 80’s I ran a small poultry operation. 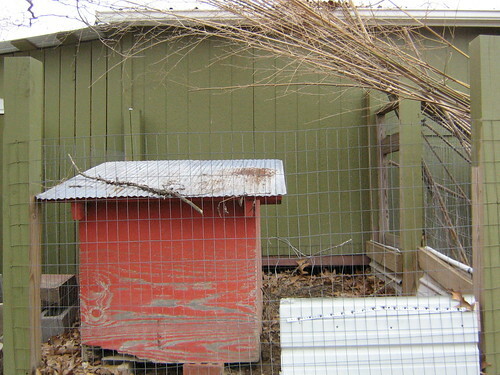 I used a recycled box truck bed as a coop, experimented with no-till farming to feed the birds, and used the bird manure in the garden. I didn’t know what organic was back then, but by today’s standard, both the eggs and meat produced would be pretty close to organic. In the early 90’s I moved to the city and left my farming life behind. Today, I am a technologist by trade. I don’t consider myself a true computer geek, but I suppose most people would. I am the guy with the smart phone, laptop, busy schedule, project deadlines et al. My life today is VERY plugged in. Needless to say when my wife suggested getting into poultry, I was the consummate skeptic. I didn’t think we had the time for birds because I remembered all the DIFFICULT things about it, I also wasn’t sure Jennifer was really up to the task. I couldn’t have been farther from the truth. As Jennifer went down the path of poultry husbandry, I followed right behind with a watchful eye. I was tasked with housing, and was able to tap into latent abilities learned on the farm many, many moons ago. I began to remember the REWARDING things about caring for birds. I began to connect with dormant parts of my history. 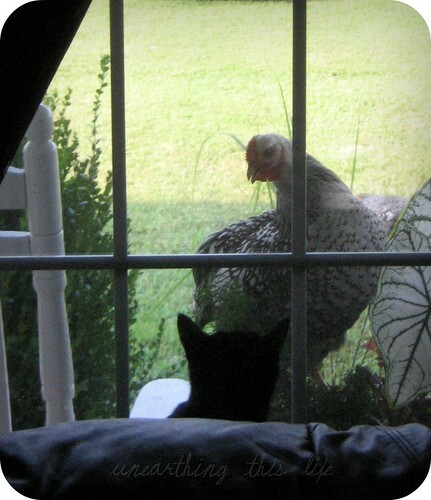 Now that Jennifer is 100%, certifiable bird crazy (read that any way you want), I continue to find other connections in her blog. I also connect to what all of you do. At one point or another, I have been reminded of the person I once was by every Lady on this blog. Your writings and photographs clearly relay the passion that each of you has for Not Dabbling in Normal. That passion helps me unplug from time to time. I stop to appreciate the beauty that surrounds me. Thank you Jennifer. Thank you Ladies of NDIN. You all have a great thing going on here. I will continue to lurk as long as you all continue to write. 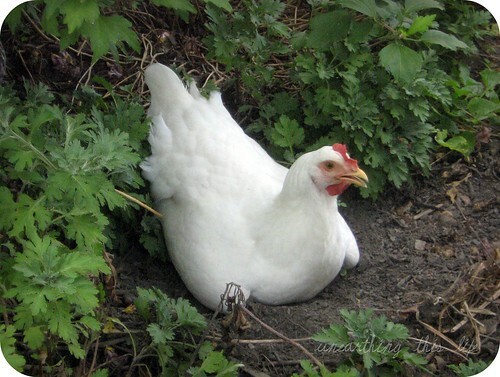 This year we ordered 8 heritage breed hens for laying. We’ve had so much fun with the girls that we’re considering raising more poultry for meat this next year. 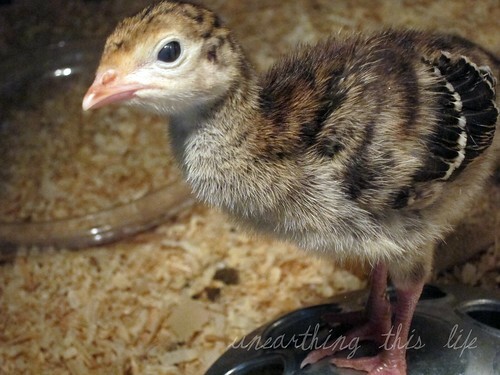 While my Hubby raised lots of birds in his younger days, this is my first time around poultry. And there’s a lot I’ve learned about raising my first flock (all while listening to Hubby in the background saying, “I told you so!”). I was adamant that we allowed our hens to free-range. When they were younger we had much more room for them inside their portable run, but now that they’re almost fully grown the run is barely big enough for two girls. So, they pretty much have the freedom to run all over our property. 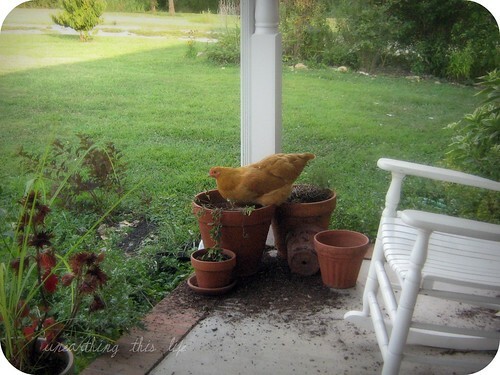 During the hot afternoons I can usually find the gals underneath our porch, cooling off. Once the heat starts to wear off, though, I’m in for some trouble. About 6:30 pm every day they enjoy a nice stroll, pecking, pecking, pecking their way up to my edibles garden. 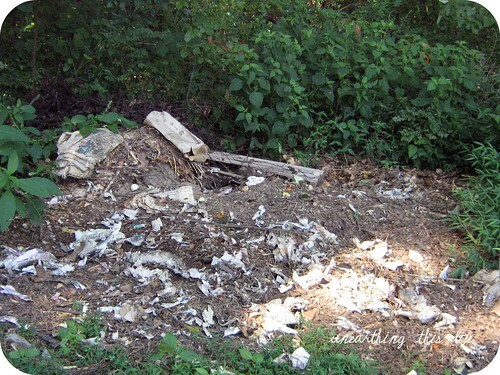 A few will even head up toward the roadside to find goodies in the brush. I can almost set my clock to it. When they’re not under the porch, the girls are busy shredding up my garden beds, ridding me of weeds, insects, and mulch. Judging by this display I’d consider their work leans toward the Post-Modern. They also like to make work of my compost piles. I’ve learned to put plantings up high and out of reach. 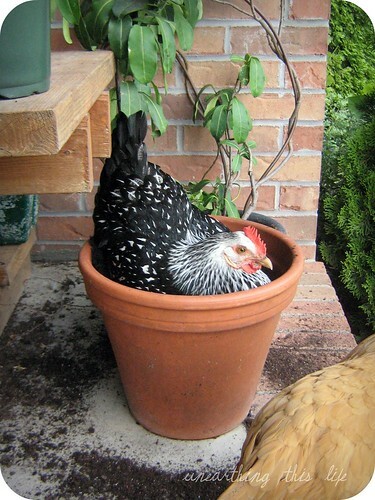 Chickens are like 2-year olds – they have their limbs in EVERYTHING! And even putting things out of reach doesn’t guarantee that they will be safe. Of course the fresh eggs almost make up for the messes. But it’s a moment like this that reminds me to giggle. What have I learned these first few months? Broilers and Roasters will definitely need a bigger portable run!! Jennifer can be found at Unearthing this Life where she shares snippets of her rural life, recipes, and other blarg-worthy stuff. Going through this real foods plan has really bolstered my opinions about the foods we eat. For the past two years I’ve been working toward being less reliant on ready-made foods and eating out of our garden or avoiding plain and simple: junk. 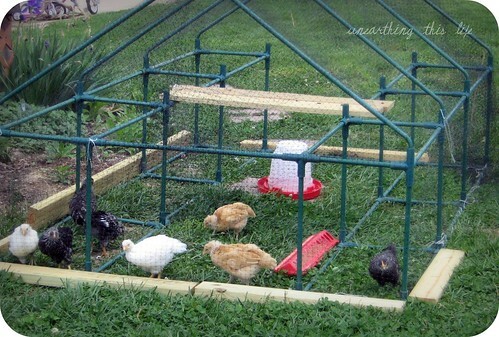 Part of my goal towards a more self-sustainable life has been to raise chickens. My first batch of chicks will be arriving in a matter of days. I feel like an expectant mother again with all the preparations: Do I have the right kind of food; can I take good care of them; will they have all their digits; what if they don’t like me; what if I fail at being Mama? Hubby’s good at reminding me I’ve got nothing to worry about regarding most of those concerns. You see, he used to raise chickens way back when he was a kid. He was a member of the Future Farmers of America and even judged chickens. He had upwards around 50 chickens at one point in time – and he grew some of the feed himself. Quite impressive for a little punk in high school. “No, I didn’t. Look here, these two pieces fit together … and … well, they were supposed to. They were next to each other on the shelf,” I proclaim. “Okay, okay. I guess I’ll replace that one.” I feel like a big dork, to borrow one of Kim’s phrases. “So, what are you going to keep them in?” he asks. “Well, I thought I’d go try to find one of those plastic swimming pools and,” I start. I continue to debate whether the box will be large enough for eight birds and question if two boxes of four birds would be better. He assures me they’ll be better as a group because they’ll stay warmer. 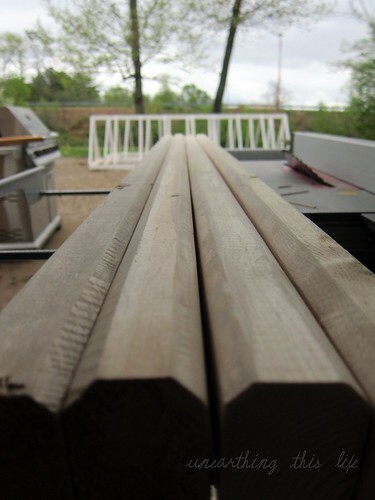 Then I figure it out – our coldframe! We found a winner! There have been several discussions where my research has paid off, however. Back when Hubby raised birds it was commonplace to clip their beaks. I’ve successfully talked him out of that one. He’s changed my mind about the coop several times. I’m determined to build a portable tractor out of scrap material. We’ve met in the middle about 100 percent free-ranging versus bagged feed. Mama again. And this time with Octuplets. Oh my, I’m the Octomom of chickens! I have to remind myself just why I’m getting birds. Fresh eggs. Manure. Tick control. Yes! Yes! Yes! Most of my birds are heritage breeds. I felt it was a no-brainer. They’ll be shipped as one day old birds, already sexed and vaccinated. Our daughter is excited about our bundles of cuteness (I am too). She’s even prepared for the off chance that we get a rooster. She has been playing her make-believe games with roosters named “Dinner”, “Lunch”, “Fried”, and “Chicken Fried”. I don’t know at this point if I could do the deed – I apologize to earthworms if I sever them while digging. I about cried when I found our wild honeybee hive was dead. Do you have any ideas about food that have changed since starting the Real Food Challenge? We have been producing and selling eggs for the last five years. 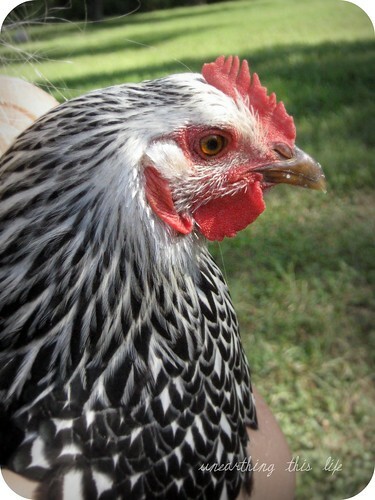 Our flock is made up of a mix of old fashion and cross bred production hens. 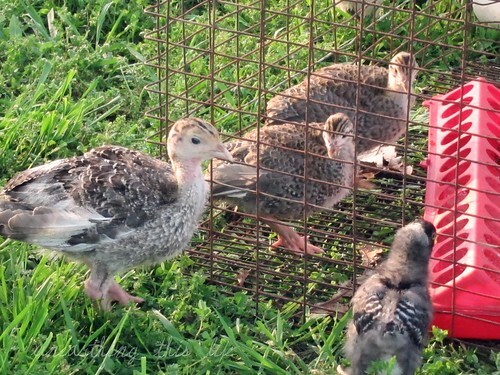 We have maintained a flock of 25 birds of various ages. We have also collected some data on productivity and cost using different feeding strategies. 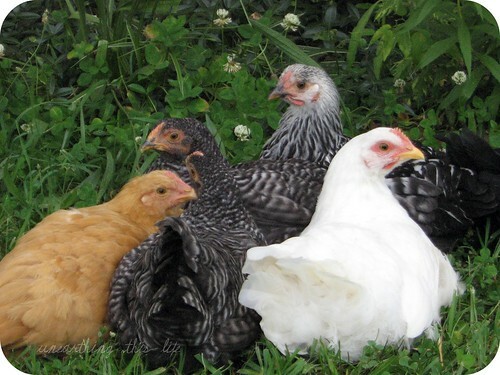 The charts below are based on our 25 hen flock, locally produced conventional chicken feed ($12.00 for 50 lbs. ), and three different feeding strategies. Our second experiment was 1/2 feed for a year. 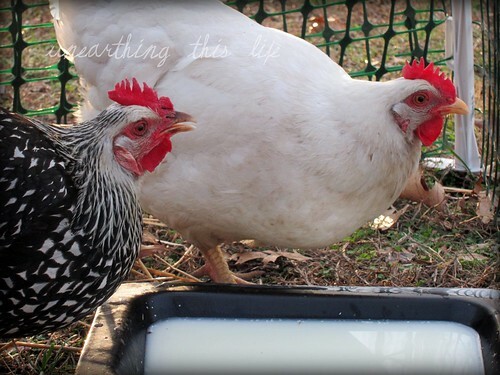 We fed 1/8 lb of chicken feed and expected the hens to forage out in the pasture for the rest. We rotated them behind the goats and cows. They ate lots of greens, bugs, and did a good job cleaning up the pasture. 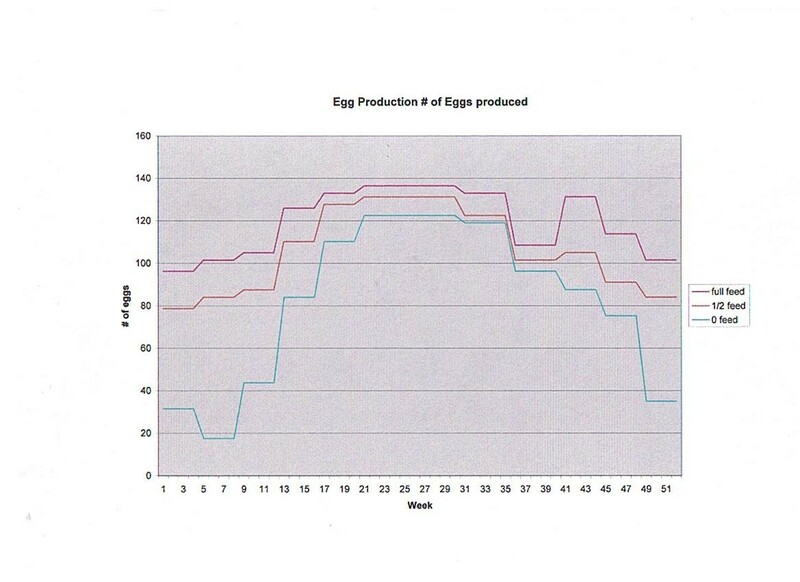 Egg production fell of quite a bit when the weather got cold, but they kept producing at at least 50%. Using this method our production costs stayed well below the selling price. We made a profit of at least $0.50 per dozen on all the eggs we sold. In the peak production time it was closer to $1.00 per dozen profit. Our last test was to feed them nothing. We ran this test for a year too. (we did give them kitchen scraps, but we have done that with the other two tests, so it didn’t change anything. This was the least productive and the lowest cause. I was supprised how productive they were in the warm season. Very close to what we got on half feed. When it got cold and dark they really dropped off. We let them have complete access to the animal pastures, the gardens, and the yard. The only other negative I noticed from this method was the mess. They can take apart a flower garden or a lawn in pretty short order, and they will as they look for food. Even though this method had the best production cost, we will not do it again. Having a third of the year where there are very few eggs is a good way to lose customers. It was also pretty hard on the gardens, the lawn, and my nerves. We will be continuing our production flock this year. We’ll use our half feed/rotational grazing method. It is a lot of work, but we got the most out of it, both financially and in pasture improvements. 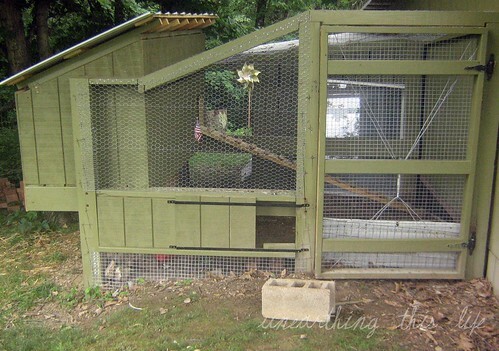 We will be experimenting with adding light into the coop this next winter (not easy when you move the coop every few days and it can be as far as 600 fee to the nearest electrical outlet.) That should help keep our winter production up a bit. We will also be trying some grain production to see if we can economically grow our own feed. I don’t know about you but at the end of the main growing season I always have all these notes in my head about what I loved and what I would do differently next spring. I am going to make my ‘notes to self’ right here on the blog…hope nobody minds. Tomato cages are wayyyyy better than this…it worked well for the cool spring but tomatoes need cages to grow up in…those tunnels did not control them nearly enough. Remember to build more tomato cages before next year. 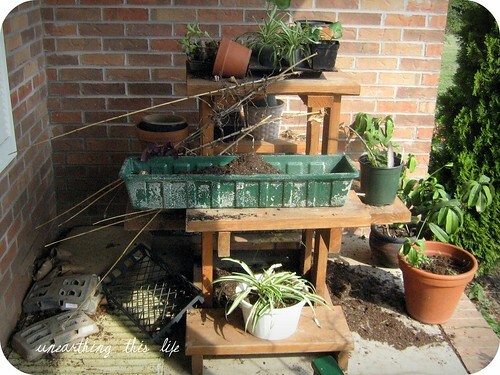 Yarn does NOT work as well as twine for green beans, it stretches in the rain and all the beans fall down…so don’t be lazy and go find the twine next time! Put a self-closing hing on the garden gate…the dog likes cucumbers. Growing peppers and eggplant in tunnels is an EXCELLENT idea, please remember do this again. Pumpkins are great fun to grow…more are needed next year. Try some new colors. Squash takes up a LOT of room, remember this so the compost bin doesn’t get covered with vines. Barrels are great for potatoes but you would need many, many more to have a large harvest. Yum, yum peppers are simply the cutest and sweetest peppers ever…grow lots more! 6 foot wire fencing is perfect for growing peas. 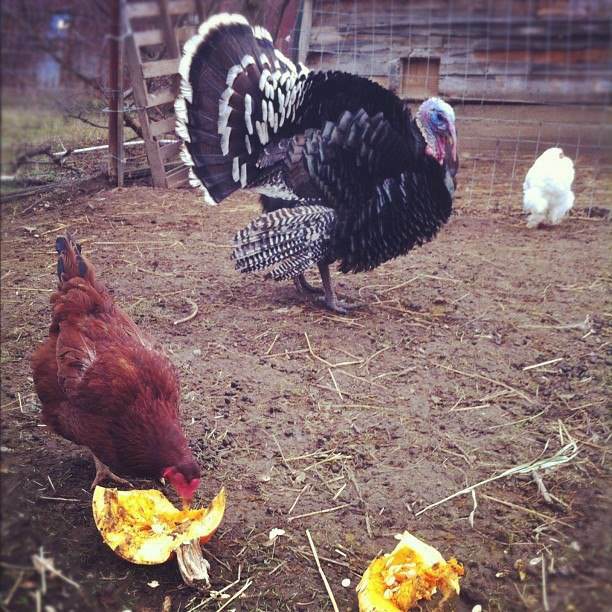 Chickens love young pumpkins, which will grow up to be ugly hen pecked pumpkins. Always, always involve the kids…even when they annoy you. Which is anything he can do to try to reach your precious garden. For the health of your family and the health of the planet. 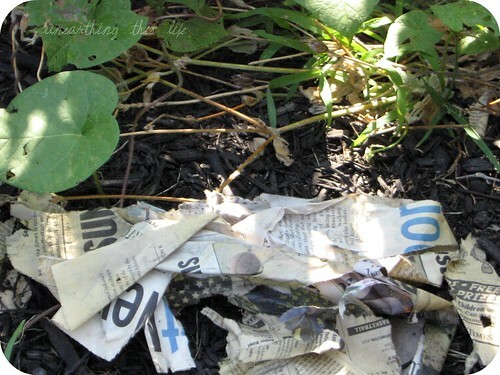 So fellow gardeners…what notes have you made to yourself for next year?